Fully customizable FileMaker-based business starter solution. fmIgnite Starter is a CRM (Customer Relationship Management) system that you can use to begin building a complete custom solution using FileMaker, the #1 workplace innovation platform in the world. LuminFire provides fmIgnite Starter unlocked and editable for FREE. fmIgnite Starter is a great foundation to expand on and to build your own ERP (Enterprise Resource Planning) tool. Plainly named tables, fields and scripts. Relationship graph built using the anchor-buoy method. Card windows are used for the contact selector. Script parameter passing utilizes native JSON functions. Set up to integrate well with BrilliantSync, our “sync as a service” that makes communicating with external web services and keeping data in sync with your WordPress website simple and worry free. Fields and tables are named in a similar way to our fully featured fmIgnite business solution framework. You can use fmIgnite Starter as is, customize it yourself, or if you love it and want it to do more, you can decide to upgrade to fmIgnite Pro. fmIgnite Pro has over 10,000 hours ($1.75 million in R&D) invested in it. We’ll make sure the data migration process goes smoothly. We have versions of fmIgnite that are built for specific industries: Manufacturing, Creative Services, and Art Galleries, to name a few. You would then gain all the custom features required for your business type while still being able to fully customize the solution. fmIgnite Starter’s UI design is elegant, modern, and easy to use. Buttons are easily discoverable in blue for navigation and grey buttons are used for everything else. Themes and styles are identical to its’ big brother fmIgnite so that even layout elements can be moved to a future fmIgnite Pro solution if required. 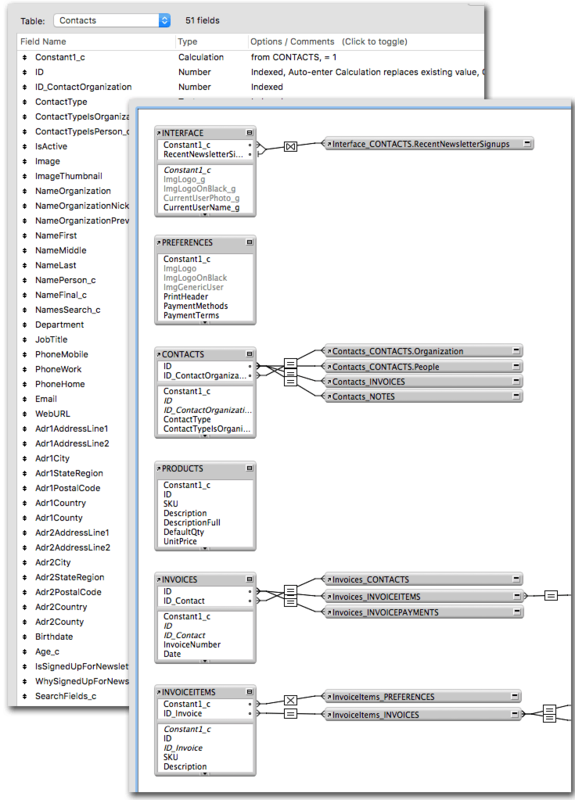 The data model is designed for simplicity and flexibility. For example, Accounts, Employees, Clients, People, and other common tables are combined into a single Contacts table so that components can be reused and applied consistently throughout the solution. For example, if you add a module for sending messages via Slack, any Contact in the database can utilize it without building an integration for each separate entity. For simplicity, estimates are handled via an invoice in Quote status rather than requiring 2 additional tables and many additional layouts. One goal of this solution is to let FileMaker be FileMaker. We’ve not attempted to reinvent the things that come built in — where FileMaker provides a built-in toolbar, we allow access to it. We have not included complex InsertFromUrl (aka cURL) calls and API integration technologies in fmIgnite Starter because they are not required when you pair the app with BrilliantSync. While FileMaker 16 added extended support for JSON and cURL commands, these can’t insulate you from the constantly changing APIs of web services. Using BrilliantSync allows you to connect to the web using ESS and core FileMaker script steps — no Computer Science degree necessary. 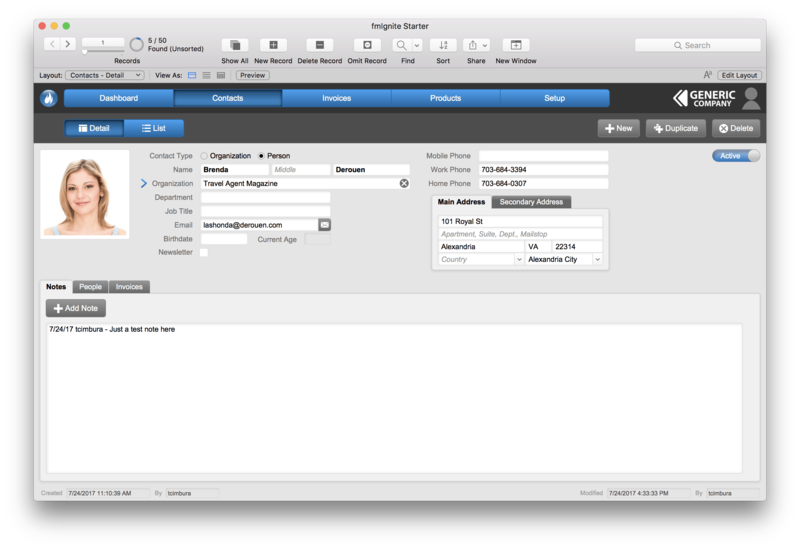 For someone new to FileMaker, we believe that fmIgnite Starter is a great place to start. It is simple, clean, organized, and understandable. It’s a solid foundation upon which you can build your key differentiator and technology solution for your organization. And, unlike other solutions, it has a clear and efficient upgrade path to fmIgnite Pro, our enterprise FileMaker business solution. Download your fully unlocked and modifiable copy of fmIgnite Starter today and start building your ultimate custom business solution.